PARTS! Also, my WTB/T List. I will be out of town until Sunday the 28th. I will do my best to check PM's during this time, but I might not have internet access. Please be patient, and if you're interested in something, send me a message. I will reply as soon as I can. This is the new version of my "I Heard You Like Parts" thread. Just one huge edit. - Don't lowball, the prices are cheap enough as is. - Prices don't include shipping. Most of the stuff is small, so that should be cheap. - Everything is sold as-is. Most of it works, but I can't be sure if some stuff does. 2) G36K RAS, MG36 bipod, AG36 launcher. 3) SHS High Torque motors. 4) G3 Parts. CETME wood kits, retractable stocks, short outer barrel. NEW! Internals Lot - $50 FTF, $60 Shipped. Highlights - Systema boreup kit, SS piston head (installed, never cycled), BNIB SHS M130, V3 gearbox shell, 4 complete gear sets, and more! Basically emptied half of my internals bin. Condor Hydro - $15. No bladder. (2x) Condor Double AK Pouch - $15 for both. 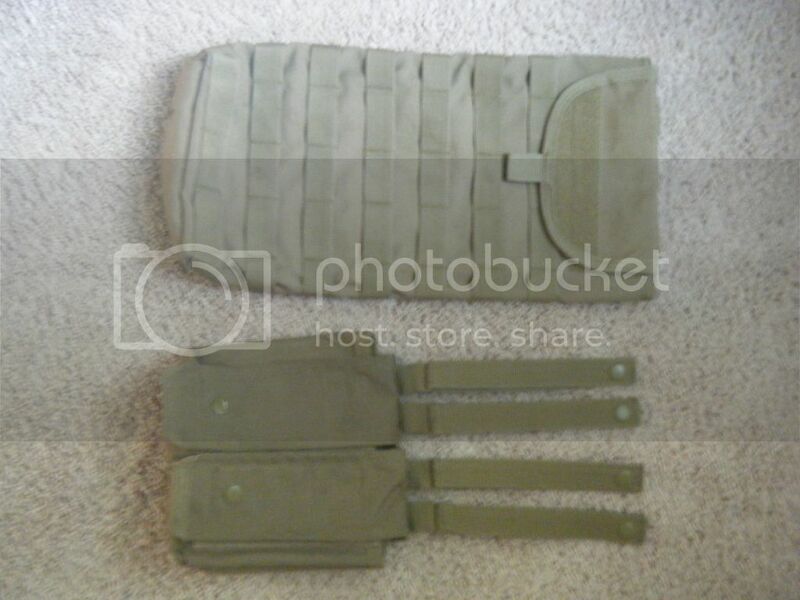 Second not shown, and is missing button on one of the MOLLE straps. This is what is left of the big parts lot I bought recently. Cheap pricing. All Barrels - $5 each. Specify which one you want. Barrel + 2 Piece Hopup - $10. The hopup is feels like it is glued to the barrel. Tokyo Marui AEP Battery Charger - $10. Not sure if it works, as I don't own any AEP's. L96 Spring Sniper Mags - $5 each. $15 for all 4. All seem functional. SR25? Charging Handle - $5. Has a little extender thingy on the front, and is bulkier than the M4 handles. Comes with spring. AK Hicaps - $10 for both. One is missing the bottom plate. M249 Carry Handle - $5. G&G Striker Spring for Tanaka M24/M700 - SOLD. Seems to be BNIB. MP5K Cocking tube, front sight, and sling mount (Plastic) - $5. No charging handle. 2x Woodland Pistol Pouches for Belt - $5 for both. 2x OD Pouches - $5 for both. Not sure what they're for, and I have no idea what brand they are. Cheap make, they feel plasticky. 2 Piece Hopup Feed Tube - $3. Fake Bolt Catch - $3. M4/M16 Stock Sling Mount - $3. Buffer Tube Washer Things - $3 each. Hold the screw in the buffer tube. Triangle Sight - $5. No hardware. L85 Carry Handle - $5. Triangle Handguard Front Holder - $3. Delta Ring Pieces - $5. Comes with both of the far bottom right parts. Metal M4 Carry Handle - $5. MP5K Stock - $10. Mounting hardware looks broken. AK Reciever Cover - $5. Plastic 1 Piece Hopup - $5. Comes with a few of the gears, etc. Shoddy Bipod - $5. No idea what they're for. Have like 5 of em. G36 C-Mag (High Quality) - SPF. Motor replaced with hobby servo, wired to Deans. Takes a small 7.4v lipo, not included. Broken UK Arms G36 Drum Mag - SOLD. The motor housing snapped off inside, should be fixable. 2x MC51 Charging Handles - $5 each. Plastic. For G3/HK53/MP5 Type weapons. TM Style G36 Magwell - $5. Painted tan, probably JG brand. PPA G36 Magwell Adapter - SOLD. Small area is melted on one side. CM M4 Outer Barrel Parts - $10. Includes 2 piece outer, delta ring, front handguard thing, and front sight. M4 Barrel Extension - $5. The smaller part of a convertible outer barrel. CA25 Outer Barrel + QD Can - SOLD. E1 G36C Stock - $10. Never in battle. Army L85 Lower - $40. Stock piston stripped, replaced with SHS. In full working condition. It was once part of my beloved L85 thing, the Most Ghetto Gun of AO. CA M4 Upper (X-Series?) - $15. Rear tabs filed down. Will not fit CA M15 lowers, I tried. CA M15 Lower - $15. Some areas filed down. Will not fit X-Series uppers. CM M4 Upper - $5. Plastic. Bare bones, nothing on it. Aftermath (A&K Rebrand) M4 Lower - $5. Plastic. Comes with selector. TM MC51 Handgaurd + Pin - $10. TM G3 Upper - $10. Missing a couple parts. TM G3 Lower + Grip + Selector pieces - SOLD. MP5 SEF Lower - $5. MP5 SD Suppressor End Cap - $3. Threaded. G3 Outer + Barrel Clip - $5. G36C Outer - $10. Threads stripped. Not shown in picture: CA? M249 hopup. Seems to nice too be E1/A&K. Don't have any of the knobs/barrel lock/gears/etc, just the metal unit itself. $15. Will sell ALL things listed for $125 firm. Will not ship as a group. Thanks for looking! Please offer/ask questions via PM. Last edited by P y r o; 08-05-2012 at 08:04 PM. Reason: Stuff added. Trades list reduced. Bump it up. Items sold/traded, trades updated. Yawn. Bump. Nice stuff for sale, trades updated. Weekend bump. Will be at Crucible until Sunday evening, and likely will fall into a coma after that. So if you don't get a quick response, that's why. Bump. More stuff sold, offer up. If you buy more than 5 items, I'm now offering a 25% discount. Bump. Will probably only bump this once or twice more, if you're interested in something, PM me soon. BUMP! Thread overhauled, items added, deleted, trades updated. Send me some offers, super interested in a G3! Bump, finally got a G3. The bipods are all G3 / HK33 style bipods. Overdue bump. A whole second picture of stuff was added. EVERYTHING listed for $125. Bump. Interested in a 416, can be broken. Would love an AGM 416 body without internals. Bump. SR25 parts, TM G3 lower, and the striker spring are SPF. Also, trades updated. Bump. Back in town. Parts listed in above parts are sold. Will be taking these down soon if no one wants them. Will sell everything else listed for a mere $120. Bump. Broken G36 drum mag, the C-Mag, and M4 adapter are sold. Trades updated, yet again. I see an ICS M4 hop-up. Do you have any more ICS M4 parts? what all dose the SEF lower fit brand wise ?